What do Calibishie Cove guests say? We got home last night, and just wanted to say a very big thank you to you and the great group you have working at Calibishie Cove! It was the best vacation we’ve ever had 🙂 Hazel and Arl were especially awesome and really made our stay extra special. It was so great that Arl was able to arrange for the kayaks because that ended up being one of my favorite days. We looked forward to Hazel’s delicious breakfasts every morning! The housekeeping was also stellar and every time we returned after a long day of activities, it was like walking into the room for the first time. Guest post by Jeff and Candice, from Dallas, who chose to spend their 10th anniversary getaway with us! “Everywhere you go becomes a part of you somehow” is a quote by writer Anita Desai that my wife and I put in our wedding favors ten years ago today. When we decided to put this quote on the gifts, we had in mind the places we’ve been and the places we will go together. Well, ten years later, Dominica will become a part of us. When we started planning our anniversary trip six months ago, we searched the Caribbean for places that fit our off-the-beaten-path travel style. Until visiting Dominica, we have been to seven different Caribbean islands, each one more remote and rustic than the last. However, this time we were looking for something much different, this trip is to celebrate our ten year anniversary! It’s also our first time in two years to travel without the kids! We have been taking care of our two wonderful children (daughter Hope 5 and son Dillon 2) and now we wanted someone to take care of us! Our search to be “taken care of” ranged from typical resorts on busy, commercialized, tourist trap islands to over the top expensive private spa resorts with little exposure to the local culture. The entire time Dominica kept rising to the top of our minds as the perfect mix of local culture, relaxation and amenities. Once we committed to make the trek to Dominica, we began the search for a place to stay, before long we came across Calibishie Cove. Calibishie Cove had a clear and concise website that explained the top sights to be seen and packaged them nicely so we didn’t need to figure things out day by day. We did several of their packages and had the top travel guides on the island take us on many once in a lifetime experiences. Thank you Jenner and Benji! The true feeling of “being taken care of” comes from the remarkable staff at Calibishie Cove. Each staff member greets you with a smile and kind heart. Hazel is so genuine and is here for anything you may need! Not to mention she makes the best pumpkin soup…EVER! She prepared fabulous dinners ranging from tuna in coconut cream sauce to curried goat. Each dish melting in your mouth and served in true gourmet style. I know we will be craving each meal until we return! The on-site dinner option is a must! Tours…wow! How do you put in words once in a lifetime experiences? Calibishie Cove puts you in great hands with Jenner and Benji. Their admiration and deep knowledge of the island, makes Dominica feel like home by the end of your stay. Had we not had Jenner and Benji along to tell us what we were seeing and explain the history of the island, we would have left with a simple impression of Dominica. However, with their teachings, we leave here knowing the deep pride and rich heritage of the people of Dominica. The must-do list in our opinion Is this: whale watching, diving (if you dive), Emerald Pool, Victoria Falls, Spanny Falls and Carib Territiory. The drive along the way to each of these destinations is a joueney all on it’s own and it is where we learned the most about the island and met many locals. Each mile along the way and each corner we turned presented us with a new awe inspiring photo opportunity. The Calibishie must-do list is simple: walk to town and take in the local culture, Baptiste Beach, Hodges Beach and watching the sun rise from your porch at Calibishie Cove! Although we leave tomorrow, we are not sad because we know that we will be back! Excellent food, Excellent service, Excellent staff, Gorgeous island, Breathtaking views. Calibishie Cove is a lover’s paradise! We stayed in the Rainforest Suite which is on the Ground Floor but it was reassuringly private and we were undisturbed. We wanted to honeymoon in an eco friendly environment that was secluded, private and intimate. The Rainforest Suite is very spacious and the water pressure is phenomenal. Calibishie Cove captures the rustic, quiet, and uniqueness of the island of Dominica and provides the perfect environment for a romantic and relaxing honeymooon. I would definitely recommend this location to anyone looking for a great honeymoon destination. The staff at Calibishie Cove goes above and beyond – noticing all details. Local made soaps, nice bed linens, and great food. I have a new found appreciation for banana pancakes which I had never had before. Fresh fruit and awesome food each morning. Our friends had stayed at this hotel during their honeymoon and strongly recommended it. They loved it and the island!! The adventure began as soon as we landed. Upon arriving, we were offered some rum punch and a beautiful array of fresh fruit. We were there for one week and split our stay between two rooms. We spent our first couple of nights in the Rainforest Suite and then moved up to the Paradise Penthouse. Both rooms were phenomenal, the beds were extremely comfortable and the rooms are well appointed. The Breakfast is AMAZING!! Arl makes the best pancakes (Banana, Banana Chocolate Chip, Chocolate Chip) Yum!! It is always accompanied by fresh fruit and juices. The food is very good and it is a delight! All of the staff at the hotel are extremely friendly and welcoming. They took amazing care of us during our visit. I could just go on and on about how incredible everyone is… Trust me when I say to you that you will consider them family after your visit — We miss them and can’t wait to see them again! We chose Calibishie Cove as the place to spend our honeymoon away from it all, while also experiencing a luxurious vacation and eco-adventure. It was all that and more! From the moment we landed in Dominica and arrived at Calibishie Cove we were awestruck. Our room was spacious and inviting, secluded and private, with doors opening wide to a balcony overlooking the sea. Their view of the Dominica coastline is simply breathtaking. It was the most amazing ocean view room I’ve ever seen. Then, just steps through luscious greenery and a path leads you to a secluded beach where you can swim or take a kayak to a pristine reef where fan coral and fish thrive. 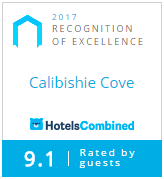 The warm, friendly, local staff who care for Calibishie Cove guests are wonderful. We spent our first night taking in the sunset from our private wrap around balcony then dining on the fresh, homemade and fabulously prepared Dominica cuisine – jerk chicken, fresh vegetables and bread – all prepared by Hazel. There’s even a well-appointed wine list for guests. Arl also made our stay warm and inviting. We were so spoiled by the platter of fresh cut local fruit with breakfast daily. –More guest comments coming soon! In the meantime, read Calibishie Cove reviews on TripAdvisor.